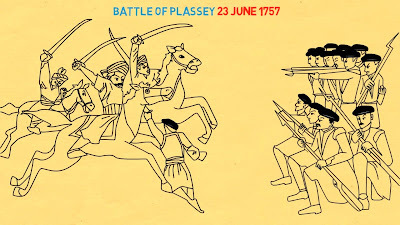 The Battle of Plassey was fought in the year 1757 AD. It was fought between Siraj Ud Daulah with the support of the French Company and East India Company. Siraj Ud Daulah was the Nawab of Bengal at that time and this battle was fought about 30 kilometers from Murshidabad. This battle is considered to be a turning point in our history and it basically established the foundation of the British rule in India. East India Company was headed by Robert Clive who had just returned after being victorious in the three Carnatic Wars. In the year 1717, the East India Company had secured special privileges through a Royal Farman by the Mughal emperor Farukhsiyar. According to this Farman, the East India Company had the right to conduct their business of export and import, without paying any taxes in Bengal. The company also had the right to issue passes or Dastaks to smoothly move their goods. This Farman was a point of conflict between the East India Company and the Nawabs of Bengal. When the Throne of Bengal was inherited by Siraj Ud Daula, who was a quick tempered person, things became worse. He demanded that the East India Company must trade on the same basis and terms which were applicable to them in the times of Murshid Quli Khan. Obviously, the Company refused to do so and without the permission of the Nawab of Bengal, started to build fortifications in Calcutta. In response to this, Siraj Ud Daulah attacked the fortifications of British East Indian Company in Calcutta which led to the tragedy of Black hole of Calcutta. 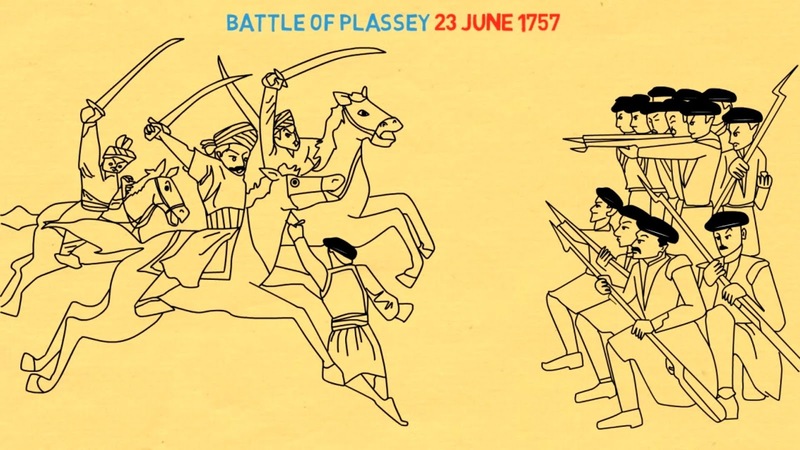 It was followed by the Battle of Plassey in 1757. Robert Clive, who was heading the forces of the East India Company, saw this as an opportunity to establish the Company’s foundations in Bengal. He convinced Mir Zafar to betray Siraj Ud Daula by promising him Bengal’s throne. On 23rd June 1757, in a small village and a mango grove between Calcutta and Murshidabad, a place known as Plassey, the forces of the East India Company and the army of Siraj Ud daula met face to face. Siraj Ud Daula had an army of fifty thousand men along with the support of the French. But Clive commanded only 800 European soldiers and 2200 Indian sepoys. During the battle, a storm hit the battlefield which rendered the gunpowder of the Siraj Ud Daula forces useless. He thought that the gunpowder of the Company’s army would also be affected in the same way and launched a cavalry attack. This cavalry was met with brutal gunshots and canon strikes from the British army. The battle was over within a few hours. Siraj Ud Daula fled the battlefield along with 2000 of his soldiers. He was killed while he was making a run for Bihar by Mir Zafar’s son, Miran. Mir Zafar was soon put on the Throne of Bengal by the East India Company. However, soon enough he realised that he was only a puppet Nawab and the British were ruthlessly taking advantage of him. He was soon replaced by a more loyal puppet named as Mir Qasim. This was the first victory of the East India Company, which started as a succession war for the throne of Murshidabad. The French Company’s ambitions for Bengal were shattered once and for all. The French company was left with only four areas which they kept until the Independence of India. The French never challenged the British supremacy again except at Masulipatnam in 1759 which they also lost. By winning this battle, the East India Company had established their roots in our country. Soon after this war, the company rejuvenated its forces with the tax collected from the Bengal province. This tax also funded a considerable number of subsequent battles which were fought with other states resulting in the company's expansion in India. The East India Company extorted huge sums of money from Mir Zafar as the price to put him at the throne of Bengal. Mir Zafar paid one crore and seventy seven lakh rupees out of which the East India Company received 1.5 crores. The rest was for Robert Clive. Although Mir Zafar had eventually succeeded in fulfilling his long term goal of sitting at the throne, but he was not at peace with the way the British were extorting him. When he realized that the demands and favors of the company would never end, he planned to retaliate with the help of the Dutch. He started secret negotiations with the Dutch East India Company to bring soldiers into Bengal to fight the British. The Dutch leaders took advantage of this opportunity and sent forces at Chinsurah. The battle took place both at sea and on land and was won by the British East India Company. Mir Zafar was removed from his title and replaced by his son in law Mir Kasim.